A-HOTEL.com - Luxury and cheap accommodation in Posëlok Trinadtsatyy Kilometr, Russia. Prices and hotel, apartment booking in Posëlok Trinadtsatyy Kilometr and surrounding. Situated in Kirovsk, 3.1 km from K6 Ski Lift, Apartment on Sovetskoi Konstitytsii features a living room with a flat-screen TV, and free WiFi. Kvartira on ulitsa Sovetskoy Konstitutsii 7 offers accommodation in Kirovsk, 2.3 km from K6 Ski Lift. Featuring a sauna, this hotel is located in Kirovsk town, 5 minutes’ walk from the City Park. The ski lifts and Kirovsk Train Station are5 minutes’ drive away. Set in Kirovsk, 2.2 km from K6 Ski Lift and 2. Located in Kirovsk, just 2.4 km from K6 Ski Lift, Ленинградская 28 features accommodation with ski-to-door access and free WiFi. Leningradskaya 30 offers accommodation in Kirovsk, 2.4 km from K6 Ski Lift and 2. Offering a sauna and free WiFi, Gornitsa Hotel is locared in Kirovsk. Continental breakfasts are served every morning and breakfasts in the room are provided upon request. Just a 5-minute walk from Sportland ski resort, this hotel is situated in the town of Kirovsk. It features a restaurant serving European cuisine. Offering free WiFi and mountain views, Ленинградская 16 is an accommodation situated in Kirovsk. This property is 2 km from K6 Ski Lift. Set 2.3 km from K6 Ski Lift and 2. Located next to a park in Kirovsk, Apartments at Leningradskaya offer self-catering accommodation with free Wi-Fi. Fusion Entertainment Centre is a short walk away. Apartment Prospekt Lenina 18 offers accommodation in Kirovsk, 2.1 km from K6 Ski Lift and 2. Located 1.9 km from K6 Ski Lift, 2 km from K7 and 2 km from K8 Ski Lift, Apartment on Lenina 11A provides accommodation set in Kirovsk. Surrounded by the Khibiny Mountains, this hotel is located in Kirovsk, on the main Lenina Prospekt. Free Wi-Fi, a fitness centre and a 24-hour reception are featured at Severnaya Hotel. 3-х комнатная квартира in Kirovsk provides accommodation with free WiFi, 1.1 km from K6 Ski Lift, 1. Hotel Ekkos is located in Kirovsk. Free WiFi access is available. Situated 1 km from K6 Ski Lift, 1.9 km from K7 and 1. Set in Kirovsk, close to K6 Ski Lift, Apartment on 50 Let Oktyabrya features accommodation with ski-to-door access, ski equipment hire, a ski pass sales point, a garden and a shared lounge. Guests may enjoy the free WiFi. 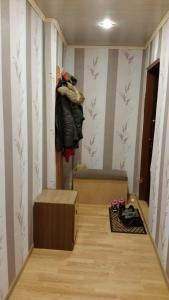 Located less than 1 km from K6 Ski Lift in Kirovsk, Apartment on 50 let Oktyabry 21 offers accommodation with a kitchen. Set a 17-minute walk from K7, the property offers ski-to-door access and free WiFi. 4sezona is set in Kirovsk, 700 metres from K6 Ski Lift, in an area where skiing can be enjoyed. The apartment is 1.